Quelques pistes utiles pour vous aider à arriver à l’Unité. Useful to help you to find us. To visit us please take into account the location and not the mail address. 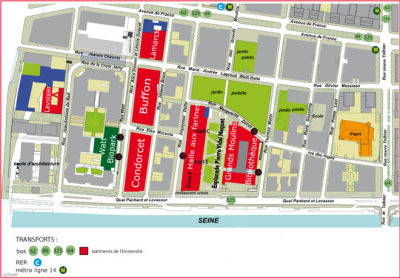 The building Condorcet is located in the campus Paris Rive Gauche of the University Paris Diderot –[Map of campus]. Inside the building, the SPHERE offices are on the 3rd, 4th, and 6th floor, rooms 387A, 389A, 390A, 392A, 393A, 394A, 396A, 397A, 476A, 688A.